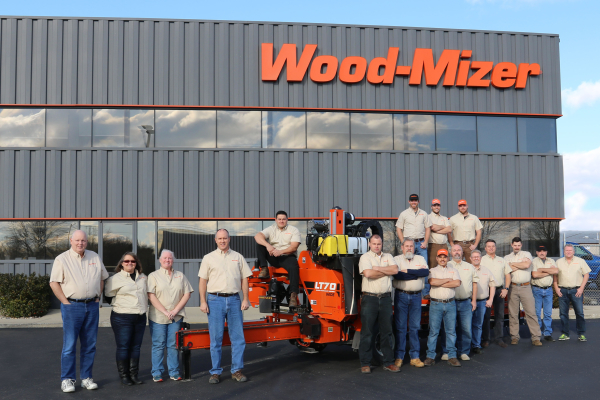 The Wood-Mizer Customer Service Team is available for all your Mechanical, Electrical, Part, and Technical Service needs. Wood-Mizer is known and respected for its legendary customer support. This is what sets us apart and why we say "Welcome to the Family," when you buy a Wood-Mizer product. If you have any questions or need technical support, we are just a phone call away. Our customer service technicians are standing by to answer your questions and walk you through any issues. Our North American customer service team consists of more than 50 knowledgeable representatives. They'll train you when you come to pick up your mill, and you'll saw your first log with the help of our trained professionals. Whether you need technical advice, parts ordering, or troubleshooting, Wood-Mizer customer service can help. Call us Monday-Saturday and talk to experts in electrical, hydraulics, and power plants. Field service charge, labor rates, parts, and taxes apply. Wood-Mizer LLC ("Warrantor"), an Indiana corporation with its principal place of business at 8180 West Tenth Street, Indianapolis, IN 46214-2400 USA, warrants to the purchaser ("Purchaser") that for the time periods specifically stated herein and subject to the terms, conditions and limitations stated herein, the equipment manufactured by the Warrantor will be free from defects in material and workmanship attributable to Warrantor so long as, during the warranty periods stated herein, the equipment is installed, operated and maintained in accordance with the instructions provided by Warrantor. *Warranty on Options will match the warranty on the primary equipment when purchased on same invoice. **Warranty subject to individual manufacturers terms on certain items.